'The director casts two attractive people where he ought have chosen a couple of actual actors instead, and thus it becomes hard to care about the protagonists or their sundered hearts, and despite aesthetic appeal, what we end up with is -- at best -- a screensaver,' says Raja Sen.
People age oddly in Fitoor. A small Kashmiri boy with innocent eyes and a Salim Sinai nose becomes a natural artist but, as if working with unreasonably heavy paintbrushes, emerges also a musclebound dimwit. A haughty young girl with a National Velvet self-confidence morphs into a red-haired waxwork unable to pronounce words that came so naturally in her youth. 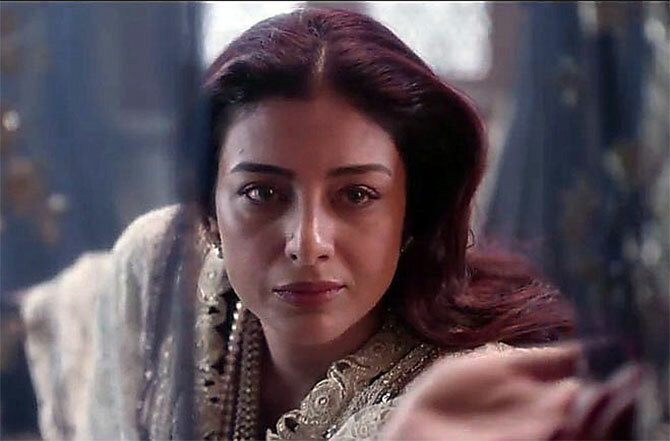 And an old opium addict, one of the most famous female parts in all Victorian literature, ages the most tragically: Poor Tabu with abruptly heightening hysteria and increasingly weird eye-makeup, growing old like a Transylvanian raccoon. Director Abhishek Kapoor might have had a fine idea on paper, given that Dickens' Great Expectations is almost entirely Bollywood in its narrative -- a vintage melodrama about star-crossed lovers, and romance impossible to snuff out -- and he does well to make a visually lush film, with opulent production design and cinematographer Anay Goswami conjuring up some enchanting, fable-like visuals. There is red-tinted Gothic gorgeousness across old Kashmiri mansions, snow in the film falls with unreal grace, as if from inside a snowglobe, and some of the long-shots are spectacular. Alas, Kapoor casts two attractive people where he ought have chosen a couple of actual actors instead, and thus it becomes hard to care about the protagonists or their sundered hearts, and despite aesthetic appeal, what we end up with is -- at best -- a screensaver. It starts off cutely enough, with young lad Noor entranced by imperious girl Firdaus, and the kids are likeable enough while Tabu puffs the magic dragon and (mostly) carries off dialogues out of an old-school Muslim Social. Thanks to Goswami's rapturous painting-like frames, this section is almost watchable despite the hideously overwrought dialogue. Everything people say is embellished and cliched, with cars being compared, peculiarly enough, to pythons (presumably because the writers liked the sound of the word ajgar) and Tabu telling the young strapling (who she has literally just met) to stir her soul with a song, for she hasn't cried in awhile. And this is just the bloody start. The dialogue gets somewhat less insufferable as the action shifts from Kashmir to Delhi, but -- catastrophically -- the performances go in the opposite direction, and drastically so. The kids are gone. Katrina Kaif is Firdaus, red of hair, fair of skin and blank of expression. Aditya Roy Kapoor is Noor, a sulky, morose character completely lacking in spirit, more squeak than Pip. He gazes at her vacuously, as if waiting to be whispered his lines, while she can't effectively be outraged at his staring because she can't say 'Staring' she manages a ghouurrna. Later in the film she even refers to him as Knorr, like he were instant soup. Ah, if only. Fitoor takes its own sweet time to unravel and the languor is unearned because the longing is unconvincing. Even when these two make love, they do so only for the cameras, putting their most photogenic feet forward. A Tale Of Two Pretties. Still, there is a visual deftness, there is music, there is a dreaminess that Kapoor creates. Unfortunately, the narrative itself comes together sloppily and builds exhaustingly, tripping over its own feet constantly through the last forty minutes. Also, somewhere around two-thirds into Fitoor, everyone appears to have lost steam. Amit Trivedi's music, hitherto evocative regardless of actors, is replaced for the most part by a background score designed to spell-things-out and underscore the overcooked dialogue. Even Goswamy, the most valuable player of the enterprise, goes through the motions for a few scenes, forcing predictable focus-shifts on Katrina and Tabu as they struggle with their lines. (Yes, even Tabu struggles. This material is atrocious.) Aditya Roy Kapoor doesn't get worse per se, but his makeup is suddenly highly visible, and there is an alarming amount of it. The third act, where Great Expectations comes together to devastating ends, is the most excruciating part of the film. In an unforgettably weird scene, an old man shows up and offers Noor a drink -- using lines that sound disturbingly and unambiguously like he's propositioning the young artist -- but ever-frowning Noor, inexplicably, hops aboard, despite not recognising him. From this point on, both film and protagonist are impossible to stomach, and since young Aditya has taken on a role this demanding, a role that needs an actor to shoulder it, he must face a large part of the flak. The character he creates is a drab, gloomy, stalker-y one, not the impassioned lover from the book. Lara Dutta, playing a savvy and exploitative art-dealer, brands his first showing smartly in order to cash in on Noor's roots, calling it The Boy From Dal. If only he weren't such a dull boy.